As you may know if you’ve followed my blog for a while, I am a big fan of Rituals. 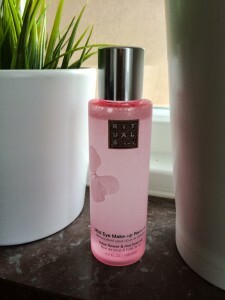 One of my latest purchases was their Mild Eye Make-up Remover. I’ve been finding it hard to find something that really works for me. I have really sensitive skin around my eyes, so I tend to get really dry and itchy from some removers. I’ve been trying removers made for sensitive eyes as well, but the ones I’ve tried doesn’t remove the eye makeup as well as I want, which result in me rubbing harder and irritate the skin anyway. But here it is, the perfect one for me! It will take miracle product for me to ever change from this one! It contains Lotus flowers, that naturally cleans and protect the skin and Rice Bran oil that keeps the skin healthy and soft. This one does it’s job and removes the makeup very easily, and it doesn’t itch. Not even a little! Another very good thing about this one is the price. I pay about $14,50 for a bottle of 125 ml. I will definatly be re-purchasing this as soon as this one is empty. I’m also very curious about the other products in this range. Have you tried these products from Rituals? What are your toughts? This entry was posted in Beauty and tagged Review, Rituals by Anna S. Bookmark the permalink. Ah, the shower foams are awesome. I put one in the shower and heard my boyfriend go bananas “THIS IS THE COOLEST THING EVER. A GEL that turns into FOAM!” Haha! The fragrance sticks are highly recomended as well! I’ve never used this brand but it sounds great! I have never heard of this brand before. Sounds great! This sounds so nice! I haven’t tried Rituals, but I might now since my eyes are sensitive too. Love your blog Just followed you on google friend connect and bloglovin. Looking forward to future posts! I haven’t heard of Rituals, but will be checking them out! Great post!